Never in my life had I experienced the Earth under my feet as I did that day. Descending from 16,000 feet after ceremony in the Andes I began running. Not so much by choice but rather because I had no other choice. The life force of Pachamama, the Earth herself, rose on up coursing its way through my body. The power of a stallion surged through me unleashing my body into an insurpressable stride. In that moment I understood how the four leggesds run across the Earth effortless, wild and free. They are not distracted by mindless chatter as they charge across her belly. They are not competitively striding to reach their destination. They are in deep communion in the most intimate of connections with the divine life force pulsing beneath them. They are fed by her, sustained by her. They open without restraint to her. Again and again and again. In a dance of glory across her belly. By the time I reached bottom all I could do was bow to the ground in a cascade of tears. To taste but a drop of her divine nectar is spontaneously humbling. To receive a kiss of her sacred elixir touches grace. The power of Pachamama is undeniable and yet this power source below our feet is often absent from our awareness. Through centuries of conditioning we have come to believe we have dominion over Earth. We walk across her belly with a sense of ownership rather than servitude. Perhaps the most blatant power play of this in our world rages between the corporate oil infrastructure and her resources. This hold on power is nearly unshakeable. Why on Earth would an oil company willingly give up this position of power? So much invested. So much at stake. So much has been gained. And so much to lose. It may be easy to point fingers at the imbalance of power in the world around us but can we see the interplay of these forces within ourself? Where have we lost our power? Where do we give it away? What beleifs about power have created the infrastructure of our life? Where has our idea of power brought harm or suffering to another? When have we abused our power? When have we been abused? What do we gain through our power? And what have we got to lose? The power play in the world around us takes center stage in our own heart. There are no easy answers to what is power but this much I know. Whatever we once thought is no longer true. Answers may not come easy but the questions are necessary to build new bridges to power within our own hearts. For a bridge to the power of our own heart creates bridges to true power in the world around us. A balance of power is a dance on the Earth rather than dominion over her. A balance of power is a union of our heartbeat with that of the Earth. It is a balance of maintaining relationship with the world around us without losing the sovereignty of our own heart. An empowered heart does not rely on the heart of another to meet its needs for love, security or approval but rather integrates the heart of another to uplift and empower. An empowered heart knows its force magnifies in union with other hearts in a force greater than alone. True power sources from a heart that is generous, a heart that cooperates, a heart that at its very essence longs to share. It takes practice to fortify our heart in this way. To avoid falling prey to the old belief structures deeply embedded in our systems. It takes courage to build a new infrastructure from the true power of our heart. How do we drop our protective armor and expose our most tender heart when everything we have been conditioned to informs us to protect, defend, attack and justify in the face of threat? This is the vision of Melissa McNair, co-director of the Feathered Pipe Foundation. This is the work of the open hearted warrior. There are ways to access this power. There are tools to keep our tender heart open. To dance in a new way with power that serves rather than suppresses. That uplifts rather than diminishes. This is the conversation to empower your heart. This is a call to your most tender heart. This is the work I invite you to join. This June at Feathered Pipe. Remember the delight in finding dandelions as a child? What did you do when you found one? You blew the wild imagination of your heart into its seeds. Off they went, set free in the wind, scattered to unknown places over the Earth. There was never any worry about when your dreams would happen. There was never any fear about not having enough resources to make your dreams a reality. You made a wish from the innocence of your heart. This is how the Shaman prays. The intent is offered to the elements of nature riding on your breath to Spirit. 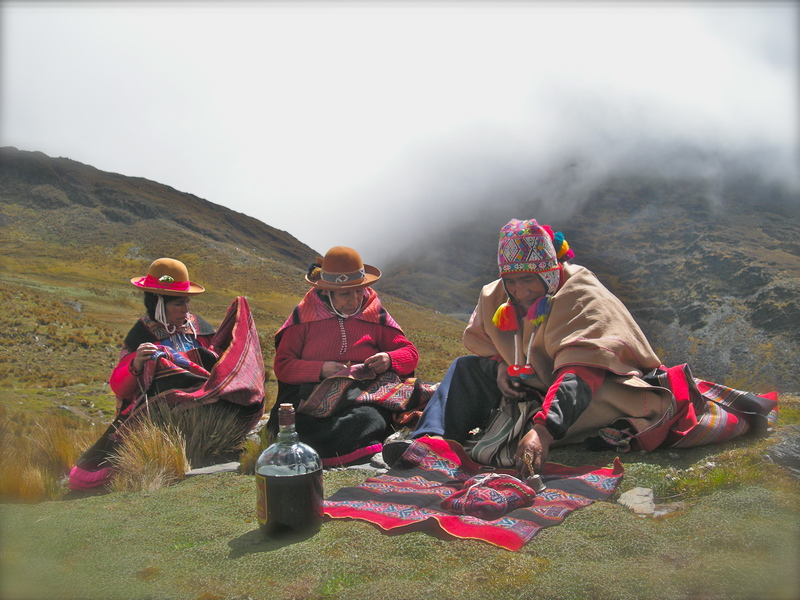 In the tradition of the Q’eros, the Shamans of the Andes, prayers are blown into cocoa leaves, then burned in a fire, buried in the Earth or offered to the wind or waters. We have forgotten this way of praying, this way of the Shaman. In your heart you know this way. We are all at our very heart a Shaman, one who is connected to Earth and Spirit. Do you think because you are all grown up this way of praying does not work anymore? Have you tossed it aside because you feel it is useless? What has been cast aside is your heart. What has been cast aside is your joy. What has been cast aside is your wild imagination. What has become of your dreams? With all your heart. It is that simple. Let your dreams take flight on the joy of your breath. Let them ride on the winds of trust. Set them free on the heart of faith. Most people think I take vacation when I travel to Peru but this pilgrammage is a journey. And there is a difference. A journey stretches me in all directions. I am physically stretched due to the adjustments to high altitudes. And that physical stretch unlocks edges of emotion, thought and old beliefs stored in my tissues. It is being at an edge of prayer through an intensity of rites, ceremony and initiations. It is vigorous spiritual work that I must surrender my heart to completely. It is a journey of joy. It is a journey of love. It is a journey home to my heart. Since I will be in Peru at the time of the New Moon this month I will not be holding the despacho ceremony online. Instead I extend an invitation for you to journey with me. To offer your prayers to ceremony in Peru. What are you looking to create in your life? What are the highest visions and dreams you hold? What are you stepping into? Who are you becoming? It is a time of dreaming bigger than ever before. Align your heart with your highest calling. Align your heart with love. Align your heart with joy. Open the portal to your destiny. This is an opportunity for your prayers to travel to heart of Peru. I will be creating a medicine pouch to carry your prayers with me. I do not know where they will end up once I am there. They may be called to Machu Picchu. Perhaps there will be a ceremony along glacial waters. Or under the peaks of Ausangate, the director of the holy mountains of the Andes where we are traveling to. I will share that with you on my return. This is also a wonderful opportunity to align your intention of traveling to Peru if it is a desire of your heart. So settle in. Take a moment. Drop into your heart. And breathe. The video below will guide you through anything you need to know. And please know this is open so that anytime you may come to offer your prayers is perfect. Your intentions are held in the energetic matrix beyond time, space and form. On a recent journey a small island of sand offers respite as a circle of dolphins swim steadily around me. Nearly every day since images of dolphins appear…on facebook, in emails, on the T-shirts of strangers. An invitation arrives from a friend to take retreat. A retreat in open waters swimming with dolphins. No surprise. Dolphins are calling. Animals carry certain qualitiies or what I often refer to as medicine. As humans we have much to learn from animal messengers if we are willing to pay attention and listen. Dolphins live in a state of unwavering joy. Just as people with heavy energy can pull us down or inspiring people can lift us up, meeting a dolphin can elevate us to a state of their vibrational frequency. Their medicine of unwavering joy is energetically transmitted. Ultimately we want to anchor our own heart in joy so we are not dragged down by someone’s negativity or need someone else to be uplifted. We become the dolphin. An anchor that can hold the space for others to rise to their own state of unwavering joy. As I plan my meeting with dolphins this summer this wisdom on Animal Totems was posted by Sacred Lodge Sister Mechelle Morgan Flowers, nearly hidden away as a comment on facebook. This medicine was just too good to miss so with her permission I share this here so you too may heed the call of the animal messenger that is calling you. You can have several animal guides through out your life. Sometimes an animal guide will come into your life for a short period of time, and then be replaced by another depending on the journey or direction you are headed toward. Your guide will instruct and protect you as you learn how to navigate through your spiritual and physical life. When you find an animal that speaks strongly to you or feel you must draw more deeply into your life, you might fill your environment with images of the animal to let the animal know it’s welcome in your space. Animal guides can help you get back to your Earthly roots, and reconnect with nature by reminding you that we are all interconnected. To first do this you need to know what your Animal Totem is. If you don’t know what your Animal Totem is there are several questions you can ask yourself. All of the questions below are designed to get you thinking about a prominent animal in your life. There are no right or wrong answers. Only you can truly know which Animal Totem(s) are right for your journey. α. Since we are drawn to that which resonates with us, what animal, bird, or insect are you drawn to? β. When you go to the park, forest, or zoo what animal are you most interested in seeing? γ. What animal do you most frequently see when you’re out in nature or in the city? δ. What animals are you currently interested in learning about? ε. Which animal do you find most frightening or intriguing? ζ. Have you ever been bitten or attacked by an animal? η. Is there a recurring animal in your dreams or do you have one you have never forgotten? α. Ask yourself what animal has played a meaningful part in your world? If you’re unsure, make a list of animals that have drawn your interest or have left a deep impression on you from paintings, photographs, stories, movies, carvings, etc. β. Which animal shows up in your life most frequently? Keep a journal of the animals present in your dreams or that you encounter through the day for the next month. How did the animal behave? Did you interact with the animal? γ. Find a place where you can be alone to meditate. Sit quietly and ask your animal to make it’s nature known to you. Feel free to use tools such as incense, smudge, and candles to help you. δ. Don’t give up, sometimes your animal totem is nearby watching to see if you’re serious about connecting with it. Keep doing the above exercises until your animal totem makes itself known to you. What animal messengers are calling you?